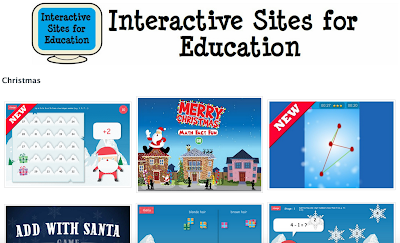 There are so many fun and interactive online resources for kids for the Christmas holiday season, so I have compiled some of my favorites to offer to you and your students to play at school and/or at home! This is a *HUGE* compilation of Christmas-themed activities that would be a fantastic resource for at-home learning or indoor recess! I love how this site is organized: there are covers for each of the games and they take kids to various sites that practice math, strategy, patterns, and more. It's also ad-free on this first page, so it's not as visually distracting as others. To access this great collection, click HERE. This site offers five pages of Christmas-themed games for your students. This also includes strategy games and challenges, math, crosswords, and more. While it's a bit more visually cluttered than the site above, the games are different and my third graders can still easily navigate to the different choices-- you may just want to point out the different page number links at the top. I also love how this is not full of pop-up ads or video commercials everywhere. Find this Christmas collection HERE. For *years*, my third graders have loved this game! They were so excited to find it in a holiday theme, as was I! The premise is so simple-- drop the sugar into the cup for points-- and kids can add shelves to make the stream more accurate. Scenes change on each level, as does the amount of cups and their location. 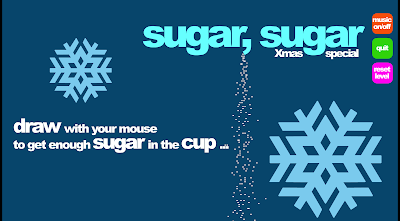 For the Christmas-themed Sugar, Sugar, click HERE. While this is the most ad-filled of all of the collections, they do offer new choices that are very kid-friendly, so you can decide if it's worth the extra distractions. You can also weed through the choices yourself to choose the activity or activities that work best for your class. There are more strategy-based games included here, so kids will need to problem-solve more than some of the above links with easier, more straight-forward games. To view this collection, click HERE. 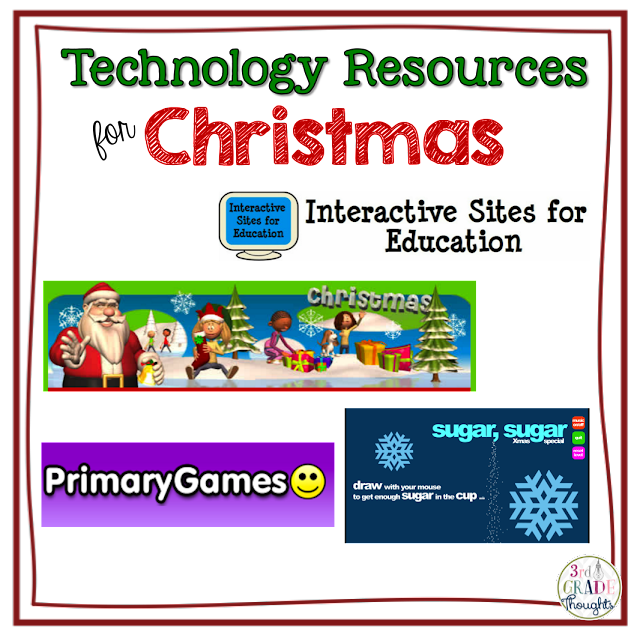 I hope these technology resources are able to keep your kids in the holiday spirit and engaged in some Christmas fun both at school and at home! 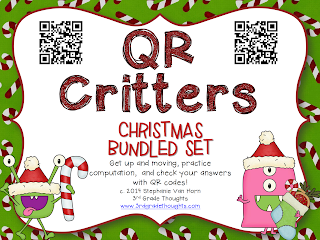 If you're looking for some equally-engaging Christmas-themed class activities, be sure to check out my Christmas Word Work, Christmas Writing Prompts, and Christmas QR Critters for Math!